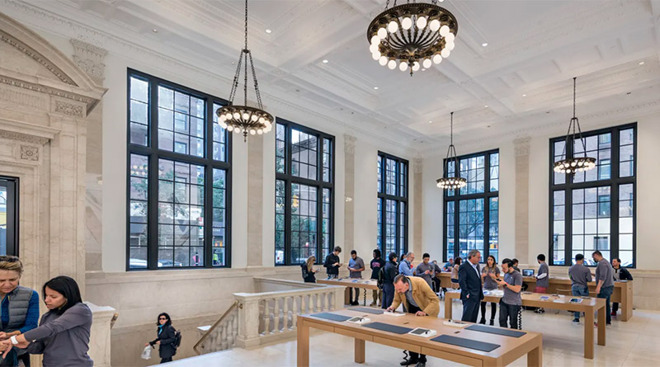 Apple Upper East Side was among four Apple stores -- Apple SoHo, West 14th Street, Upper East Side and Grand Central Terminal -- recognized by the New York City Landmarks Conservancy's 2016 Chairman's Award for "marrying modern technology with distinguished architecture." Apple was granted the honor in recognition of preserving and restoring notable historic structures in New York City. This store is my local Apple Store and every time I walk into it I’m blown away by how impressive it is. I am beginning to think Apple needs a few more kickass products to complete with these vast and elegant spaces. Don’t want the package to outshine the contents. Yeah. Look up from your phone every once in a while. My guess is Angela had to diversify something (from what’s essentially still Ron Johnson formula, which isn’t wrong anyway yet) and then came up to town squares. In fact, AppleStores very much have become gathering places for people waiting for battery/screen replacements, travellers checking their mail/web, and kids. To attract the herds from Starbucks, McDonalds and pizza stores there is this “formula” - developed by a brand supposed to sell anyway via other channels. Free coffee (as a substitute for product substance ?) may further develop the customer experience. I am so glad to see these old structures renovated and honored. Pittsburgh, during and after the decimation of the steel industry, tore down many of its fine old structures that were built during its industrial era (1870-1970) in favor of steel and glass modernization. It was a tragic loss that can never be recovered. And, ironically, today many of those steel and glass monstrosities are themselves being torn down because they are junk. Interesting that those chandeliers turned out to be elements that were recreated from scratch by studying old photographs. Those caught my eye as soon as I looked at that interior shot. I don't know how Apple stores don't win awards non-stop. They are amazing monuments to functional design, taking the best and most essential aspects of modernism and perfecting it even further. Maybe the simplicity of the designs mask (for many people) the boldness and restraint that are what make the spaces so incredible and monumental. Perhaps the lack of appreciation is just another consequence of post modernism. Where everything is a reaction to a reaction and logic need not apply. The absurdity of post modern architecture is actually a good analogy to the absurdity of the philosophy as a whole. Where being contrarian for contrarian's sake is celebrated, because it is seen as immoral to be associated, in any way, with existing power structures, which are perceived (mostly illogically) as inherently oppressive (despite ushering in the lowest rates of worldwide poverty and disease since humanity began). For those that ascribe to post modernist thinking (deliberately or de-facto, as a natural consequence of following popular culture), anyone that is successful within this system (e.g. Apple), is inherently complicit in the perceived oppression, and is thus immoral, and needs to be taken down. This is why Apple does not get near the credit it deserves for all of its efforts for environmental and social justice issues, despite being a clear leader in these areas; Apple's success is a direct contradiction, and thus a threat, to the core of post modernist philosophy, which causes a high level of cognitive dissonance in post modernist 'believers.' (I say 'believers' because there is no consistent logic there, so proponents only have faith, and emotion, to go on). Only self-described 'intellectuals' could convince themselves that post modernism is a positive thing.